The first CB bootleg to date. The songs were taken from a promo-cassette we sent out to labels soon after recording “Your lies in check”. The bootlegger picked all those sung in italian off an alternative remix which wasn’t supposed to be used on any record. So even if it’s once more “your lies in check” material, this has a slightly different mix (guitar and bass are a bit higher). 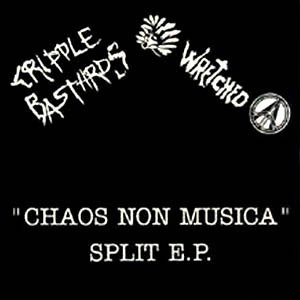 Wretched’s side has their trax from Split 7″ with Indigesti (1982) + a couple live cuts from the legendary show in Torviscosa (later included on the “Lotta per vivere” collective CD). We got knowledge this boot. came from Brasil or anyway Souh America and since it wasn’t that bad, we never tried to fight back the responsible of it. The few copies we managed to reach had an insert with lyrics/infos added by us. > Released in 1996, no cat. # mentioned, 1000 copies (? ), manufactured in South America (Brazil?). > CB added a lyric-sheet + explanatory page to all the copies they managed to reach. > Various grammar mistakes on the song titles/statements they put on the center-label of the record.